Those who stroll through the roads of the region of Bonito, even if they are good observers, will never imagine the treasures hidden by the thick woods of thr "cerrado" vegetation. The true treasures of nature! Rivers of crystal clear water rich with life in all is variety of forms and sizes, where you can practice snorkeling or scuba diving. In some of these rivers more than forty species of fishes and countless species of plants are found. In others, there are beautiful waterfalls, formed by the combination of the deposition of plants and wood over rock and the high concentration of calcium carbonates in the water, in an interesting natural process. If all the beauty of the rivers is not enough, in the region of Bonito there are many caves. They were formed millions of years ago. Some are underwater, totally or partially, adding even more beauty to their naturally decorated interior. For this reason, Bonito is a paradise for cave divers and those seeking adventure. The geological and climatic characteristics of the region of Bonito are the biggest reason for the efforts to the conservation of this area. The calcareous rock that form all the Bodoquena Sierra (Plateau) are easily dissolved in water, forming caves, waterfalls, and also generating rivers of crystal clear water. Bonito is set on Brazil national scene as one of its best Ecotourism destinations, not only for its beauty, bu also for the city organization and good quality of service. Among the main activities offered to the visitants are: snorkeling, trekking, hiking, horseback riding, bird watching, rafting, rappelling and scuba diving in rivers, lagoons and caves. 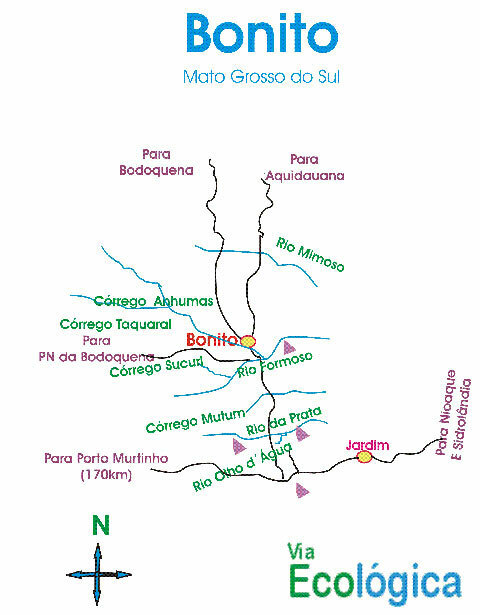 The main ecotourism and adventure tours in Bonito are: Recanto Ecológico Rio da Prata, Gruta do Lago Azul, Abismo Anhumas, Estância Mimosa, Rio sucuri, Boca da Onça, Buraco das Araras, Rio do Peixe, Bonito Aventura, Ceita Cure. But there are many others!! Schedule a week stay in Bonito, and enjoy each day a new landscape! Extend your trip with a visit of the Pantanal, another must see ecotourism destination in Brazil!